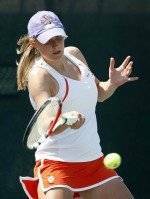 CLEMSON, SC – Clemson freshman women’s tennis player Nelly Ciolkowski has been named the 2010 Carolina Region Rookie Player of the Year by the ITA. Ciolkowski, who hails from Neiully-Plaisance, France, was chosen out of every freshman that competes in Division-I women’s tennis in North or South Carolina, which currently includes four top-25 teams, and seven NCAA Tournament squads. Ciolkowski boasts a 29-7 overall record in her freshman season, and has been ranked as high as 61st in the nation this year. Her .806 winning percentage is tied for sixth-best in Clemson history among players who have played more than 25 matches. She becomes the second Tiger to garner the honor, joining five-time All-American Ani Mijacika, who was selected in 2007. Ciolkowski, who has posted a 5-2 mark against nationally ranked foes, has been a key contributor on Clemson’s Sweet 16 run this season. Clemson was 21-0 when Ciolkowski won her singles match in dual match play.